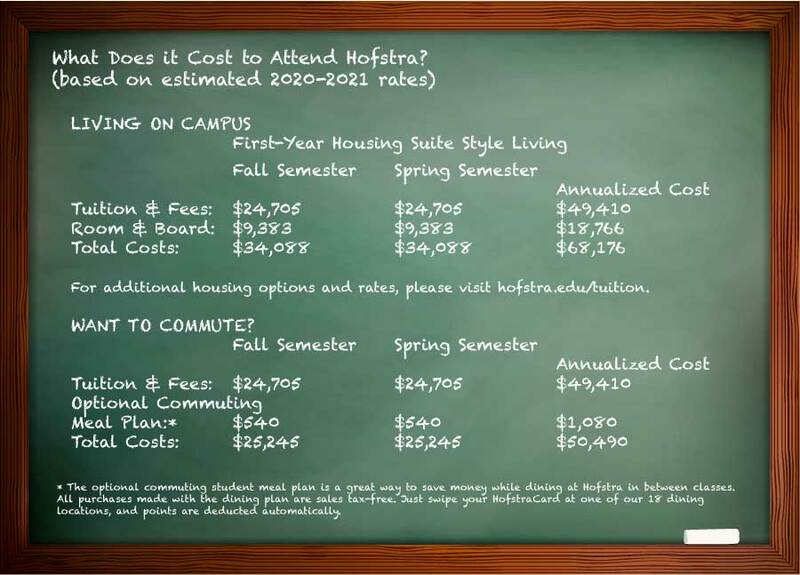 What Does it Cost to Attend Hofstra? Meet some sample Hofstra student profiles, and see their payment scenarios. Take your total costs and subtract any financial aid (scholarships/grants/loans) that you will be receiving from Hofstra and other sources – that's your net cost. See a Complete Listing of our Current Tuition & Fees. What does it Cost to Attend Hofstra University? * The optional commuting student meal plan is a great way to save money while dining at Hofstra in between classes. All purchases made with the dining plan are sales tax-free. Just swipe your HofstraCard at one of our 18 dining locations, and points are deducted automatically. student had part time job and paid for part of the balalnce from earnings and remaining balance was paid with a 529 college savings plan. * family utilized locked in tuition rate to plan out costs over 4 years. Parents & Student split loan obligation between PLUS loans & Private loan. There are ways to make Hofstra more affordable. Another way to fund your education is through scholarships. Hofstra determines your academic scholarship at the time of your admission, with no additional applications needed. 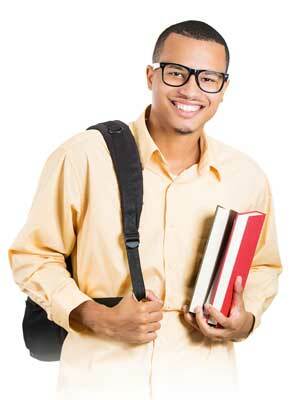 For more information on the types of scholarships we offer, please visit our scholarships page. There are also grants based on your family's financial need. You must complete a Free Application for Federal Student Aid (FAFSA) as soon as possible after October 1 of your senior year of high school (fafsa.gov). Hofstra asks that you file it before February 1 to ensure we can offer you the best financial aid package with a mixture of federal, state and institutional need based funding. Those awards are typically sent out in early March. Even if you and your family don't think you will qualify for anything, complete it anyway. It's free and you might just be surprised that you are eligible for some form of assistance. We also offer an interest-free payment plan. Students and families are able to divide their total outstanding balance, after financial aid, into easy-to-manage monthly installments. You may choose from an annual plan or a semester-based plan. Please visit hofstra.edu/monthlypaymentplans for more details. One way to make Hofstra affordable is to sign up for our Locked-In Tuition plan. This program offers you and your family a secure and predictable way to finance your education. With a four-year locked-in rate for tuition, you and your family will pay the same tuition rate for all four of your undergraduate years at Hofstra University. Every semester one or two Hofstra students withdraw from classes due to illness or accident. To protect your investment and help minimize financial losses in such cases Hofstra makes available an optional tuition insurance program, the Tuition Refund Plan (TRP), through the A.W.G. Dewar, Inc. insurance company. Information about this plan, including current rates, may be located at hofstra.edu/tuitioninsurance. This plan may help minimize your potential investment loss if your child needs to withdraw from classes and leave school during the semester due to illness or accident. Visit hofstra.edu/bursar for more information. Scholarships are generally awarded by Hofstra and/or outside organizations for academic or other merit. When you apply for admission at Hofstra, your academic credentials are evaluated for scholarships. Please refer to the scholarship award letter for the renewal conditions for each award. If you receive a scholarship from an outside source such as a community group, business or other organization, please forward a copy of the award notice you received to the Office of Student Financial Services. Visit hofstra.edu/sfsfaq for more information. Hofstra and/or outside organizations provide awards to students who demonstrate athletic talent, strong leadership, as well as performers, artists, and musicians. There may be institutional aid need-based awards available, just by filing the Free Application for Federal Student Aid (FAFSA)! Grants may also be available from the federal government and New York state and are based on financial need. Click here to see our first-year scholarships and merit awards. By filing the FAFSA, undergraduate students will be eligible for Federal Stafford Loans. Parents of dependent undergraduate students may also be eligible for the Parent PLUS Loan. The University recognizes that, after all other financing options have been exhausted, students may also need to use alternative sources of financing to help offset the costs of attendance and living. For additional information, please visit hofstra.edu/learnaboutloans. At Hofstra University, your academic and personal journey is important to us. You will receive individual attention, professional service, and extraordinary opportunities. Our mission is to support and inspire you to reach your goals. Scholars, artists, and scientists, including Emmy-winning directors and Fulbright Scholars, who are passionate about their work and dedicated to teaching and training the next generation of leaders – like you. More than 90% of our full-time faculty have achieved the highest degree in their fields. We will know your name. Hofstra University has all the resources and advantages of a large university, but the environment of a small college. You will be have a Success Team which includes a Student Financial Services counselor to assist with financing your education and two academic advisors: one to help you with scheduling, core curriculum and other issues, as well as a professor in your major to mentor you, and to help connect you with graduate schools and internships. Average class size at Hofstra is 21, and professors – not graduate students – do the teaching. Regular visits by world-renowned artists, speakers and political leaders. More than 200 student clubs, service organizations and a robust Greek community. Free admission to all our 17 Division I sporting events. Campus concerts and performances that are usually free for students with a valid ID. Stay fit and stay health with free access to our state of the art fitness center and Olympic-size indoor pool. Free trips to NYC, just 25 miles away, with faculty/staff begin during Welcome Week and continue throughout your college career, with the First Year Connections program and the Explore Next Door program. A library designed to connect you to the information you need. A Career Center that offers everything from one-on-one appointments with career counselors, to etiquette dinners and on-campus recruiting from hundreds of companies annually. A campus shuttle provides free rides to the Long Island Rail Road and bus hubs (hourly), local shopping and entertainment venues. Satellite TV (100 channels), high-speed internet and landline phone are included in all residence hall rooms. Free tutoring to ensure that you get the most out of every one of your classes. Free counseling services because everyone is overwhelmed once in a while. A Health and Wellness Center to treat your everyday ailments. We have a physician on staff and a team of nurses dedicated to keeping you healthy. Parking--- Yes, parking is free, and all students may have a car on campus.